In the age of medical cannabis enlightenment, Colorado is becoming a place where miracles happen. The story of ‘Supernova’ represents the hope, challenges and lives transformed of parents desperately seeking to heal their suffering children – in a state where nascent freedom battles the entrenched forces of oppression. The Free Thought Project obtained an exclusive interview with the mother of Nova, a beautiful 5-year-old girl born with a very rare condition called Schizencephaly. Nova’s mother, whom we will refer to as Barbara, told us about her journey from Texas to Colorado to save her daughter’s life, and even give her the gift of laughter. “When Nova was four months old, we got the phone call on a Saturday night, from an endocrinologist, asking us if we had a minute to sit down and talk. 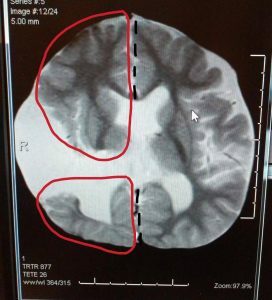 My world was flipped upside down when she told me more than half of my child’s brain hadn’t developed during pregnancy. Born without a pituitary gland, legally blind, and with a large unilateral cleft consisting of almost the whole right side of her brain. At five months old, the first seizure happened, while Nova’s dad was giving her a bath. It only got worse from there. “For the next two years, on top of all of her other medical complications, she would suffer from endless seizures of all kinds. She spent many of those days in status epilepticus. Status means that you are in a constant seizure and this is extremely life threatening. If she wasn’t in status, the breaks from having a seizure were few and far in between. The outlook for children with schizencephaly is grim. Some patients are stillborn, others are “not compatible with life” and others succumb to medication-induced organ failure. Barbara has connected with parents of children suffering from this condition, and many have lost the battle. By the time Nova was two years old, she was having all types of seizures and was taking six anti-seizure medications. But they weren’t working. Doctors had turned to simply trying to sedate her, including the use of benzodiazepines – potent psychoactive drugs known through names such as Xanax and Valium. If Nova wasn’t in a state of seizure, Barbara says the cocktail of drugs kept her in an immobilized, completely unresponsive state, with no apparent awareness of her surroundings. Barbara tearfully described a moment when she tried to get Nova to play with some small bells, lifting Nova’s hand to touch them. But Nova, eyes rolled to the back of her head, just let her hand drop. 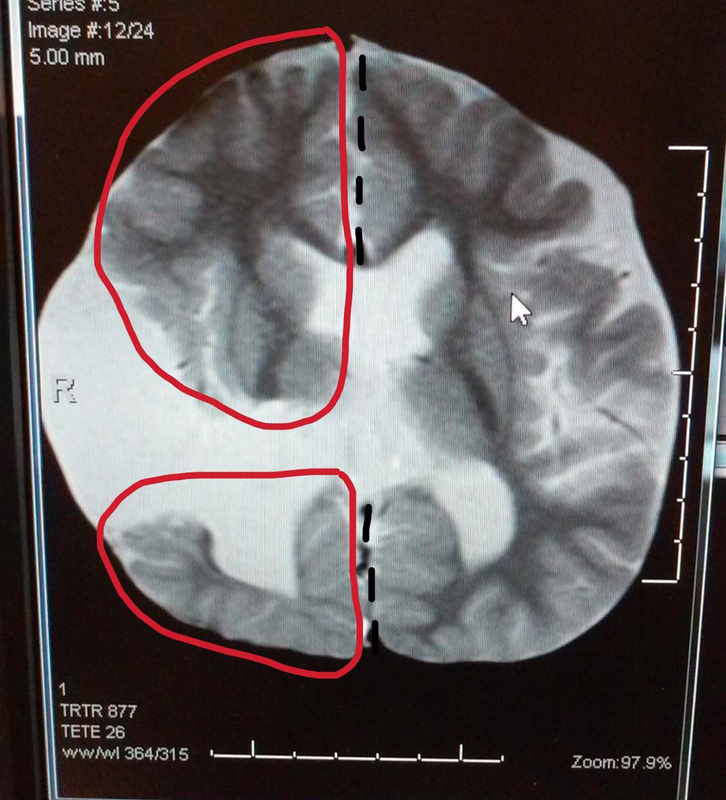 Barbara began to “question how [Nova] could ever have a quality of life.” After several MRI and EEG scans, the Texas neurologist said Nova was a good candidate for brain surgery called lesionectomy, which would remove most of the brain she had left. There is no guarantee it would work, and the extreme procedure could result in Nova’s death. Barbara initially agreed to the surgery, feeling hopeless about her daughter’s continued existence or the possibility to have any quality of life. However, the year was 2014, and Colorado was making big news with its legalization of recreational cannabis. This enormous step for freedom was also helping to galvanize awareness about medical cannabis, especially in the field of childhood epilepsy. Barbara had the strength and the intellect to perform her own research, reading peer-reviewed scientific studies on PubMed and elsewhere. She connected with people who were finding success in medical cannabis where other drugs failed. Barbara came to the conclusion that she could not allow the surgery until she tried this plant-based medicine. It was working wonders for many children suffering with unrelenting seizures – without the debilitating effects of pharmaceutical drugs. One day, in a pivotal moment, Barbara’s friend said, “What are you waiting for?” Barbara and Nova’s father packed up their belongings, left everything else behind, and moved to Colorado Springs. “We had to try cannabis oil first. You heard the stories everywhere, on the news and on the internet. Parents claiming that their children were saved from oil made from cannabis plants. To some it sounded far-fetched. Some didn’t believe we would actually have the guts to go. But more people had our backs completely, and supported our decision ten-fold. After three days, Barbara procured CBD oil, which is high in the cannabidiol (CBD) compound. (tetrahydrocannabinol, or THC, is the other major compound). It was a whole plant extract, so it contained some THC as well. Nova had a bad reaction to the high-CBD oil, which made her seizures even worse the next day. Barbara’s hopes were almost crushed. But she found some parents treating epileptic seizures with THC oil, which she then tried on Nova. The results were immediate and miraculous. The very first time Nova got a 10 milligram dose of THC oil, she “lit up almost immediately.” She smiled and laughed. After a day, the seizures stopped. Barbara announced on Facebook that Nova had, for the first time since diagnosis, gone 24 hours without a seizure. Amazingly, this little girl – who was having 100 seizures a day – went to having one seizure episode every 3-4 weeks. For one and a half years Nova received a high-THC, low-CBD whole plant extract. During this time Nova’s mother weened her off the anti-seizure pharmaceutical meds, beginning with the milder ones. Nova was making gains in speech and movement, but with every seizure at the 3-4 week mark, most of those gains were virtually lost. She responded with, ‘as little CBD as possible.’ Incredibles started working on it, and weeks later a technician named Derek produced a distillate of pure THC infused in oil. They called it Supernova. From the time of the first dose, Nova went five and a half months without a seizure. This was the answer to Barbara’s prayers. Barbara tearfully described how Nova underwent a steady progress in movement and speech. She can go from laying to sitting, now says ‘dada’ and ‘mama,’ has learned to clap, identifies her toys and is looking around with the curiosity of a happy child. For the past four months, Nova has not had to take a single pharmaceutical anti-seizure medication. She no longer has to get nightly growth hormone shots or take Desmopressin sodium medication or Levothyroxine thyroid hormone. “Since her seizures are gone she is learning to play. Her favorite things to do are practice standing with her daddy, getting dressed, playing with her rattle, and dancing while I hold her upright in my arms. She also likes to have long talks- babbling at me with such a happy tone and disposition that you can’t help but to laugh from the warm feeling in your chest. 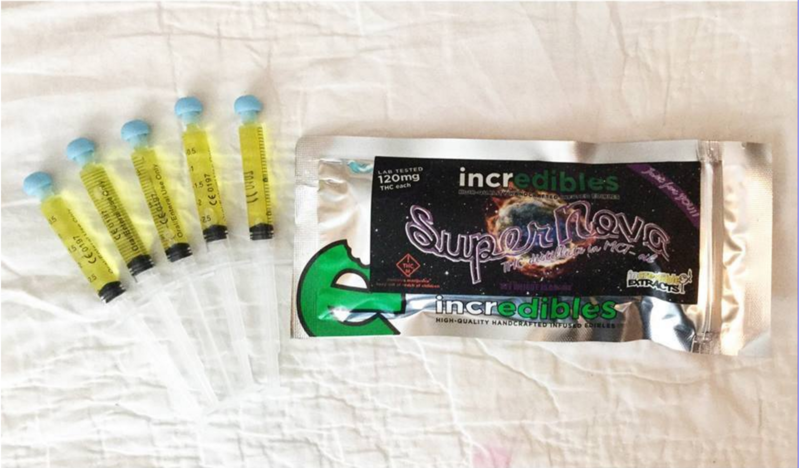 Nova receives 30 milligrams three times a day, which is a relatively high dose of THC oil. But the alternative – Nova having constant seizures, living in a virtually paralyzed state through pharma meds, or undergoing the high-risk brain surgery – is unthinkable. Since beginning the Supernova THC oil, Nova has experienced one seizure episode which was due to complications from an misdiagnosed infection. After treating the infection, Nova is back on track and has been seizure free for more than a month, as of this writing. Barbara has big dreams for Nova and sees a long life ahead of her, as long as she has access to the miracle of cannabis oil. “This is something that should be available to all children- and my child is living proof that cannabis oil DOES work. Better than anything I could have expected. But even in Colorado, there is no guarantee Barbara will always be able to access cannabis oil through “proper channels,” as the forces of oppression and irrationality haunt the lives of those seeking to heal their children. The U.S. Drug Enforcement Agency (DEA) regularly threatens doctors who dare help parents access medical cannabis for their suffering child. Shockingly, doctors cannot even mention medical cannabis or acknowledge that it helps a child, for fear of losing their license. Even Nova’s neurologist, having witnessed her improvement from 100 seizures a day to zero seizures, must remain silent on medical cannabis. To legally treat Nova, Barbara must acquire a “red card” which has to be signed by two doctors and renewed every year. Her main physician is proud to sign the red card, but one co-signer has already dropped out due to government threats, leaving Barbara to search for another who can challenge the tyrannical federal agency. The DEA and prohibitionist cheerleaders would rather see kids like Nova in a paralyzed state punctuated by constant seizures, or die from the toxicity of pharma meds, than accept that a child can live, smile and laugh thanks to the cannabis plant. Adding to the absurdity of DEA’s position that cannabis has “no medical value” is the fact that the U.S. Dept. of Health and Human Services holds a medical patent (#6,630,507) on cannabis compounds as neuroprotectants. Apparently, this didn’t get around to the DEA when it had an opportunity to reschedule cannabis in 2016. Barbara believes about 200 families have moved to Colorado for their epileptic children, and that number is growing. There are currently 349 minors on the state’s Medical Marijuana Registry; most have epilepsy but some are taking medical cannabis for cancer, pain and autism. Barbara knows one other family who moved to Colorado about three weeks ago to treat their child’s schizencephaly. After the third day of low-THC treatment, their 1-year-old is already experiencing improvements. Not all families are so lucky. According to Barbara, some parents who want to move from prohibitionist states to Colorado for their epileptic children are actually intimidated by their doctors. They threaten to turn parents in to “authorities,” as they happily pump the kids full of debilitating psychoactive pharma drugs. Indeed, the cannabis plant – used medicinally and recreationally for thousands of years – represents a threat to the corporate oligarchy. Big Pharma, knowing medical cannabis is a threat to their profits, actively works against cannabis legalization at the state level – donating hundreds of thousands to disinformation campaigns. Their efforts failed in all but one state in the 2016 election cycle, but they have a strong ally in the DEA. In a world connected like never before, the power of knowledge is proving to be a potent force against the drug war establishment. Prohibitionist myths are crumbling. Doctors are embracing the potential for medical cannabis to treat ailments where other medications fail or cause harm. Politicians are defying the law to bring help to suffering children. Please visit Super Nova’s Facebook page and share the amazing story of 5-year-old Nova, so others can learn there is hope for their children. The more knowledge spreads, the more power builds in the people to overcome those who stand in the way of health and freedom.